I'm ahead on my "52 Hats for Sailors" goal, so I joined a KAL at Serendipity Yarns in Buena Vista. And I cast on for another shawl! Depending on which weather forecaster you believe, Colorado Springs will receive from 8 to 20 inches (that's 22 to 55 cm for my Australian readers) of snow this weekend. Eeeek! Knitting weather for sure! Before I show you the photos of my "beginnings," here is a "finish." This is hat #19 of my 52 Hats for Sailors project. The pattern is Noctilucent Cloud by Kate Agner, and the red yarn is Cascade Yarns Superwash Aran. 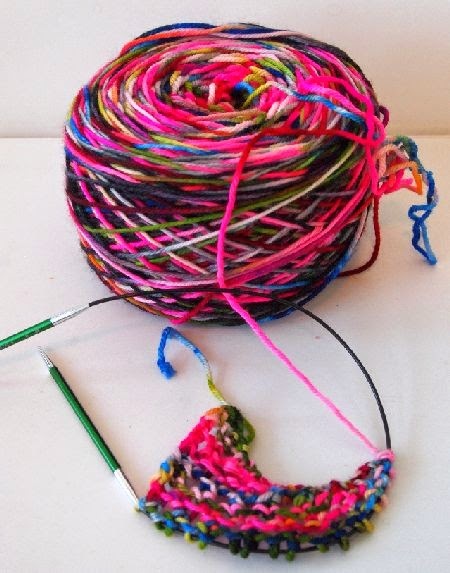 The variegated yarn is a one-off from Colorful Yarns by the Mineville Yarn Project. 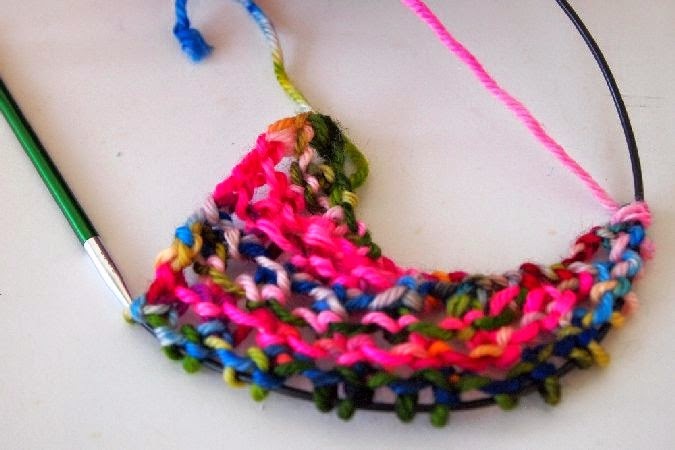 A fun, and fast, knit! I'm trying to make more "XL" hats for Sailors. Both my DH and My Little Sailor wear large-sized hats, so I figure there must be a lot of XL heads in the Navy! My first "cast on" project is the Brickless Shawlette. I fell in love with this yarn at Ewe & Me. It's "Yowza" by Miss Babs. 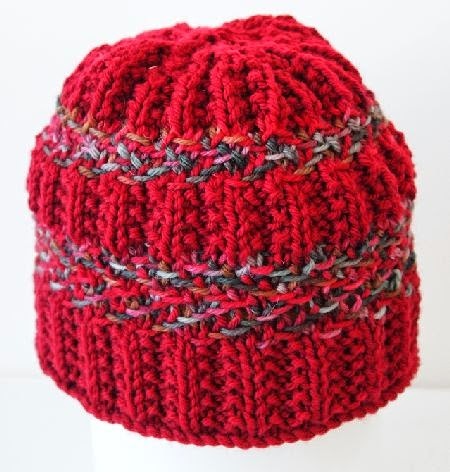 The colorway is "Perfectly Wreckless," a Babette colorway. "Babettes are one-of-a-kind, unrepeatable colorways. Several knitters chose the same colorway when Deb received the order from Miss Babs, and it's amazing how different each giant (560 yards!) skein looks. Two weekends ago, when the weather was springlike, the DH and I took BlackJack for a run across the mountains to Buena Vista. I visited Serendipity Yarn and Gifts while he went for a 6-mile run up Cottonwood Pass. 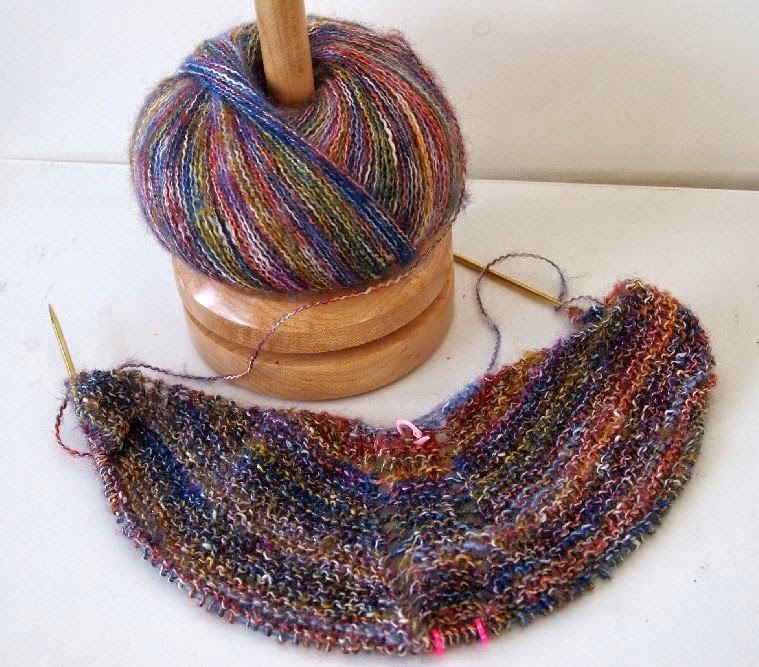 Sheryl announced the next KAL, the Multnomah Shawl. The designated yarn is a new one, Uluru, from Queensland Yarn. I've managed to lose the label, so I'm not sure which colorway I chose -- but it's turning out to be gorgeous! Although this yarn looks like mohair, it's made from cotton, acrylic and polyester. I love mohair, but I go nuts itching when I wear it. I'm hoping this will be wearable for me. If it's not, it can go into the Christmas-gifts box! I have knit two Multnomah shawls-such a great pattern! Enjoy! Like Maria - Queensland yarns?? ?